Monkey Go Happy: Stage 208 is another episode of the very cute point & click adventure MonkeyGoHappy series developed by PencilKids. 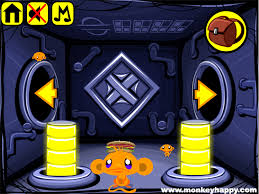 In this game, your goal is to find all the mini monkeys and make the monkey go happy! Click on objects and locations. Use items on specific spots to complete puzzles. Good luck and have fun! I did enjoy this one, good idea, but yes, perhaps it would be smoother if you could see the whole construction at the same time. I ended up drawing the diagram on paper so I could see it as a whole as I worked on it. I was able to figure out how to change the intersections and create the route I needed without much trouble after that and without any help. I did enjoy this game, thanks!